As flutists learn and grow, that student model no longer suits them. It’s time for an upgrade. There are so many different flutes out there for advancing musicians, that a trial is almost always necessary before buying a step up flute. 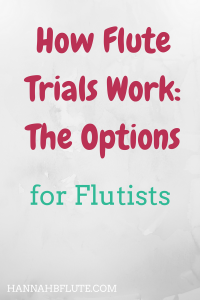 In this post, we are going to talk about flute trials, how you can get started with them, and how they work. Flute trials allow you to test out different flutes to see which one works best for you. There are multiple ways to get started with a flute trial. You can go through your own flute repair tech/dealer, you can contact a local music store, or you can go through an online store. If you are visiting a flute convention, you can also check out the exhibition hall to see what flute vendors are there. I have done trials both through my flute tech and through a local music store. I haven’t gone through an online store, and I will explain why later. A lot of flute repair technicians are also authorized dealers for some flute brands. If you need to take your current flute in for maintenance, you can ask to try a few flutes that your tech has in store. Going through a flute tech is good, because they will probably have a decent selection of flutes for your to try. As with any trial, give them your budget, and they can find a few flutes that fit your needs. Not all flute techs carry new flutes for sale, though they might have used flutes that their other clients are selling. Used instruments can be a good way to get a great instrument for less money. In person music stores are another great way to test flutes. This is how I got the most recent flute (an alto). I called a local music store and asked if they could order a couple of alto flutes for me to try. Only one of them ended up making it to the store; the others were out of stock. Once I tried the one that made it in, I fell in love. If you don’t fall in love with the first flute you try, make sure to try others. The really nice thing about going through a music store is that they handle the shipping. You call in and tell them which instruments you’d like to try, and they go about finding those instruments. I worked with an area location of a national music chain. What they did was call to other stores around the country to find the models I wanted to try. I loved not having to deal with shipping. The store also had a few practice rooms open for me to really test the flute. If you want to know how I tested my new alto flute, let me know in the comments! Some online stores, like FluteWorld, offer trials. They send you a few instruments to try. You have a set trial period, usually 3-7 days, and then you send back any of the instruments you do not want. I considered going this route for my alto, but I really didn’t want to deal with shipping to me and back to the store. If you don’t live near a flute dealer or music store, going through an online flute vendor is your next best option. Another benefit of using an online flute store is that you can choose from a wider selection of flutes. These stores tend to carry more brands than flute techs and in person/general music stores. If there is a specific brand or model you want to try, check out a few online stores. Be sure to shop around, because each online store has their own trial policy. The trial lengths differ, and some stores may require payment, even if you do not buy any of the instruments. Flute conventions and festivals are a great place to try a LOT of flutes at the same time. Big flute conventions like the NFA convention attract vendors and players from all around the world. If you want to try even more flutes than through an online store, a convention is the place to do it. You probably will not be able to take a ton on trial at once, but you can visit various booths and test the different flutes. If you have no idea what flutes you want to try, this is a great way to narrow your list of choices. Testing lots of flutes can help you figure out which ones are absolutely not for you. You can eliminate those flutes from your list to try. If you find a few that you want to play with some more, then you can make note of that and set up a more thorough trial later. There are many ways to test out a flute before you buy it. In most cases, a trial will benefit you. You can test different flutes to see which works best for you, and you can be assured that you make the right purchase. If you want to learn about how I test flutes, leave a comment below, and I can write a post all about my process!